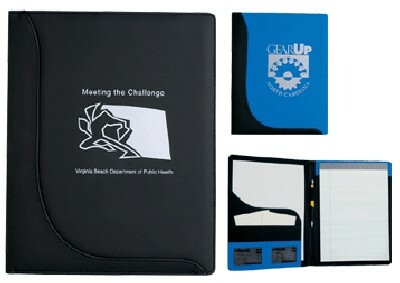 Features: * Smooth surfaced cover for the highest quality imprint with the stylish L-curve design. * Front inside slip pocket with slot for notes. * Two mesh pockets for business cards. * Built in elastic pen or pencil holder. * 11 1/2" H x 8" W notepad included. * Actual size is 12 1/2" H x 9 3/4" W.
80 1 color(s) imprint at $618 ONLY $7.73 each. 150 1 color(s) imprint at $1,067 ONLY $7.11 each. 250 1 color(s) imprint at $1,670 ONLY $6.68 each. 300 1 color(s) imprint at $1,990 ONLY $6.63 each. 350 1 color(s) imprint at $2,311 ONLY $6.60 each. 400 1 color(s) imprint at $2,633 ONLY $6.58 each. 500 1 color(s) imprint at $3,277 ONLY $6.55 each. 1000 1 color(s) imprint at $6,224 ONLY $6.22 each.